Upcycling is a popular buzzword in the DIY community these days. It refers to the creative transformation of older items into refurbished, more aesthetically appealing items. This is the essence of cabinet refacing. It’s a way to reuse the structure of older cabinets while still giving them a beautiful new look. Cabinet refacing doesn’t take as long as a complete tear-out and installation, which means you can enjoy your new kitchen sooner without much fuss. First, the cabinet expert will visit your kitchen to assess your cabinets. He or she needs to make sure they’re structurally sound. 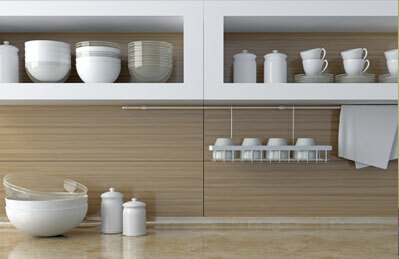 The expert will also measure your cabinets and calculate the amount of materials needed. 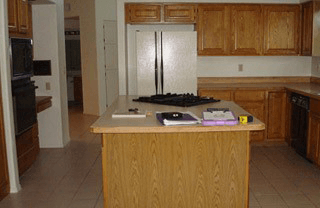 The cabinet contractor will remove the doors of the cabinets, but leave the main structure intact. The fronts of the drawers are removed. All of the hardware is also removed. The contractor prepares the cabinet doors and drawer fronts by washing them in a degreasing solution. If there are any depressions, they will be filled in with hard drying putty. The finish will be lightly sanded until smooth. Tack cloth is helpful for removing dust left by the sanding. Then, the contractor applies the thin sheet of veneer to transform the look of the cabinets and drawers. Once the veneering process is complete, the cabinet doors and drawer fronts are ready to be reinstalled. Many homeowners prefer to upgrade their hardware along with the look of the cabinets themselves. The contractor will install the new hinges and handles, and make any final adjustments necessary. The panels on the sides of the cabinets will also receive a new layer of veneer to complete the look. 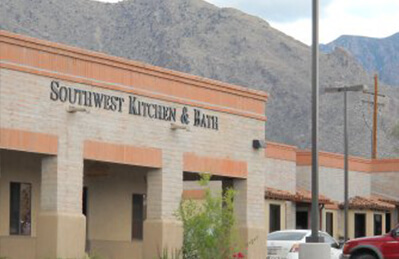 Cabinet refacing is one of our specialties here at Southwest Kitchen & Bath. 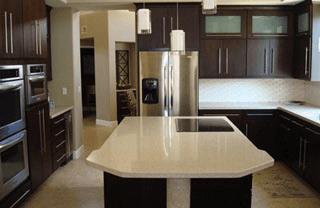 Our professional process can transform the look of your kitchen without requiring a major demolition and rebuilding project. 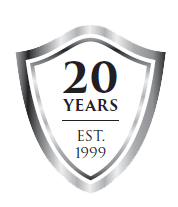 Call our office in Tucson at (520) 531-9187.